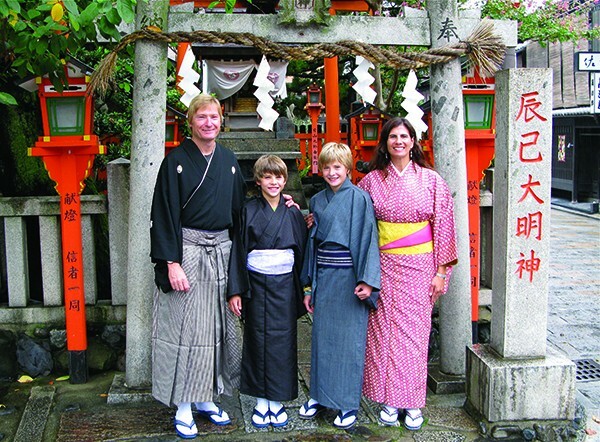 Rainer Jenss with his family in 2008 in Kyoto during their around-the-world tour. One day, Rainer Jenss looked at his wife and said, "Let's do it now, while the kids are young." They'd always been dreaming about traveling the world—probably a hazard of working at National Geographic, like Jenss did for 16 years. So when they sold their house, quit their jobs, and packed their bags to spin the globe with their two sons, then ages 8 and 11, there'd been a shift. They knew it was a little crazy, but they wanted to give their boys that foundation. "They'd see the world and understand that it doesn't just revolve around us and what we do. There are other perspectives and ways to live." They used an around-the-world ticket (issued by an airline alliance network) for 13 months, which allowed them to puzzle out the mileage and segment requirements among participating international carriers. They visited almost every continent, and spent less money than if they'd lived the year in New York. "The sacrifice is a year of income. But for me, that sacrifice was well worth it." The trip manifested into a profession: Jenss blogged the experience and was ranked one of the top 25 travel bloggers; and this March, he's launching the Family Travel Association, based in Nyack, which aims to inspire families to travel more and more broadly. "One big factor of anxiety around family vacations is, 'Will the kids have fun?' Parents have it in their heads, 'All my kids want to do is play video games,' and if you're not exposing them to things, then yeah. It's up to the parents. When you learn to travel, you travel to learn." Jenss is a big believer in the positive effects of travel on children and feels that travel should be part of every child's education. "Trips can change a child's life," he says. "They learn new skills; it changes their cultural understanding; it connects you to the environment—kids are unplugged. Kids are curious about the world, and travel exposes them to things they only read about." Most Americans, however, consider travel to be an indulgence. Studies show that every year, we leave earned vacation days on the boardroom table, and we usually rank among the highest in Expedia's annual vacation deprivation study, afraid that bosses and coworkers will penalize us for days off. The stress from work causes health issues and less productivity and costs us family time. For Jenss, it's a function of cultural values. He asks, "Why is it a virtue to work harder than someone else?" We value possessions over experience, but Jenss feels we should value a balanced life. Family travel is an opportunity to experience something unavailable at home. "Travel shouldn't just be recreational, it should be transformational." 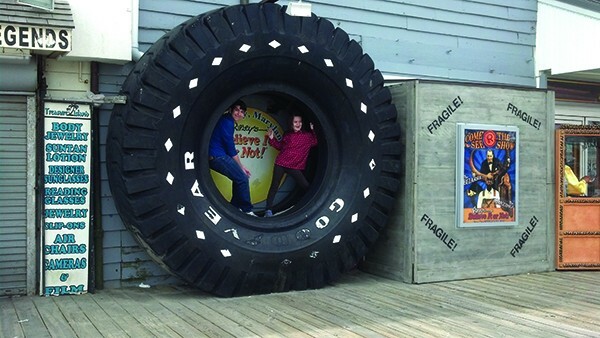 Traci Suppa of the blog, Go Big or Go Home, travels with her two children to the World’s Largest “whatever”—this time, a Goodyear tire in Maryland. For parents who worry that kids will only remember the inane aspects of an expensive trip, like the gelato in Italy, and miss the majesty of the Sistine Chapel, Jenss warns, "Don't underestimate your kids." It's about going for the authentic experience. Travelers who stay local through house rental outfits like Airbnb find a more personal, family-friendly experience. "When we were in Greece, we lived in someone's house," Jenss says. "We looked around the supermarket. It forces you to be more exposed." Family travel opens up the possibility of meeting locals, who are often especially friendly toward travelers with kids. "What's undersold and underappreciated about travel is that what's most memorable are the people you meet." To help his children become invested in the world trip, Jenss involved them in the planning process with books and movies. He had each child bring their own camera to connect with what they're seeing, a tip that works universally for engaging kids. But the ultimate goal, Jenss reminds, is "at the end of the day, you're creating positive childhood memories." As someone hardwired to track travel trends, Jenss cites one that actually merges two: multigenerational travel and the gift vacation. "People want to spend quality family time together, and travel is a gateway to do that. One clear reason multigenerational travel is growing is that grandparents have the money, and they're paying for these trips. They're more active, healthier, living longer, so they want to spend more time with their kids and grandchildren."